UPDATE: Here is the formal press announcement from the U.N. Security Council. The U.N. Security Council met yesterday to consider U.N. Secretary-General Ban Ki-moon's 33rd Report pursuant to paragraph 14 of Security Council resolution 1284 (1999), which relates, in part, to the continuing issue of Kuwait's missing national archives seized by Iraq during the 1990 invasion. 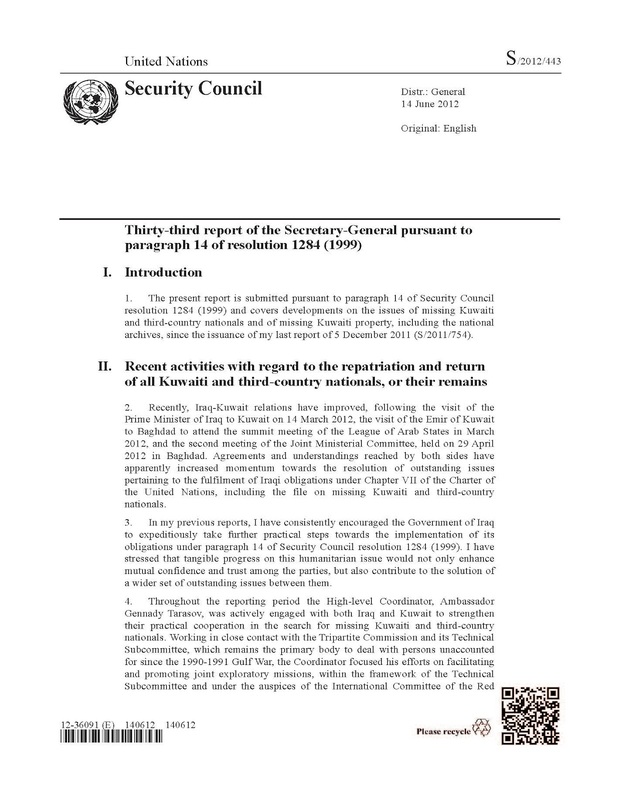 The Secretary-General's latest report again laments that "no substantial progress has been made in the search for the national archive, nor has credible information about its fate or whereabouts emerged," but notes that "Iraq-Kuwait relations have improved" and that "Iraq has demonstrated, by finding other missing Kuwaiti property [referring to the property returns here and here], that its credible and sustained efforts in this regard can bear results." had met on 4 January 2012 and recommended that the General Secretariat of the Council of Ministers should request all ministries and other non-ministerial institutions to inform the committee of any properties and files belonging to the Government of Kuwait no later than 15 February 2012. The report notes, however, that the U.N. "has not received an update on the results of those efforts." 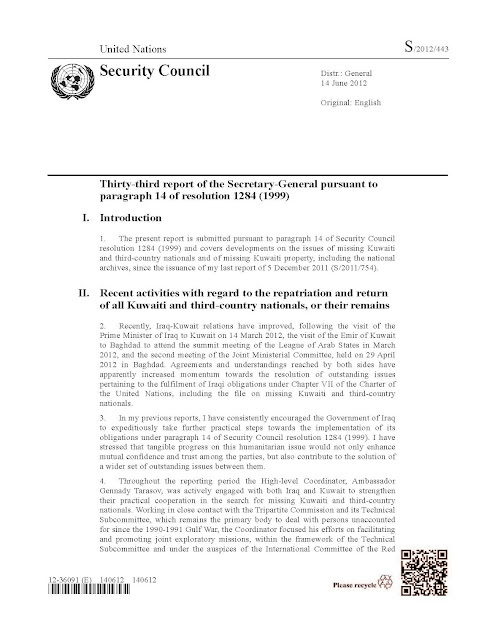 On a recommendation from the Secretary-General, the Security Council extended the mandate of the U.N. High Level Coordinator on the issue, Gennady Tarasov, until the end of 2012 and also again reiterated its earlier call for an "intensification" of Iraq's efforts to find the missing national archives.